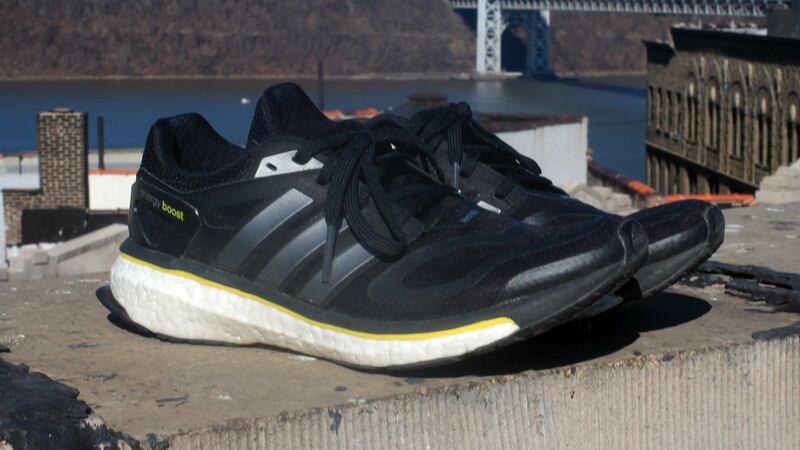 Adidas isn't the first company you think of when you think running, but its new Energy Boost shoes are getting a lot of hype. "Breakthrough for running shoes," it says. Big claims, but, surprisingly, it's backed up by the performance. 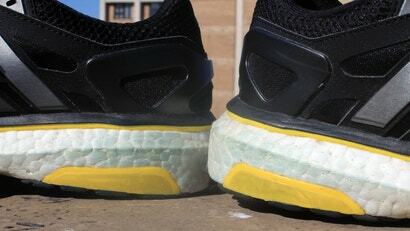 Running shoes made from a new material called Boost, as opposed to the traditional EVA foam, which Adidas claims transfers more energy to your legs as you run. This is a nebulous claim, but, under certain circumstances, proves more or less correct. A light, open-air mesh upper (Tech Fit) and a sole made of Boost foam that sort of resembles styrofoam. The sole picks up dirt in a hurry, which is a non-issue for running shoes but something to consider if you're just looking for ultra-comfy walking around shoes. 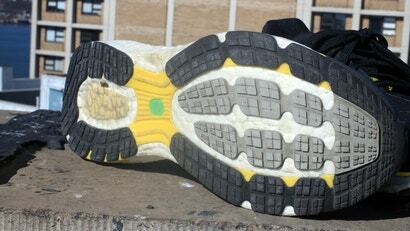 The midsole portion of the shoe squeezes your foot a bit, keeping the fit snug even if you screw up your lacing. They're good and soft. Oh man are these things soft and comfortable! And they are so in a way that's complementary to running, not disruptive, and will be more helpful for some runners than others. That's probably enough to go on, honestly, but there are some quirks to the Boosts as well. You'll feel the "technology" of Boost much more if you're a heel striker when you run. 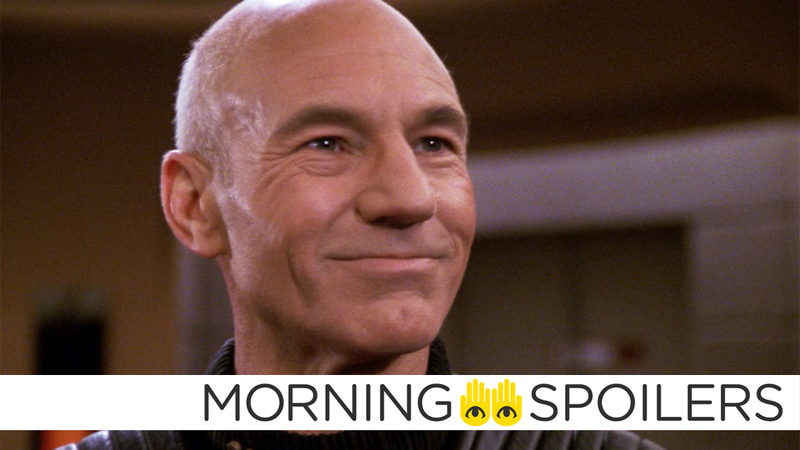 That's been out of vogue for a while now, but a lifetime of habit can be hard to shake. Striking on your heel, you feel propelled forward by the spring in the back of the sole. 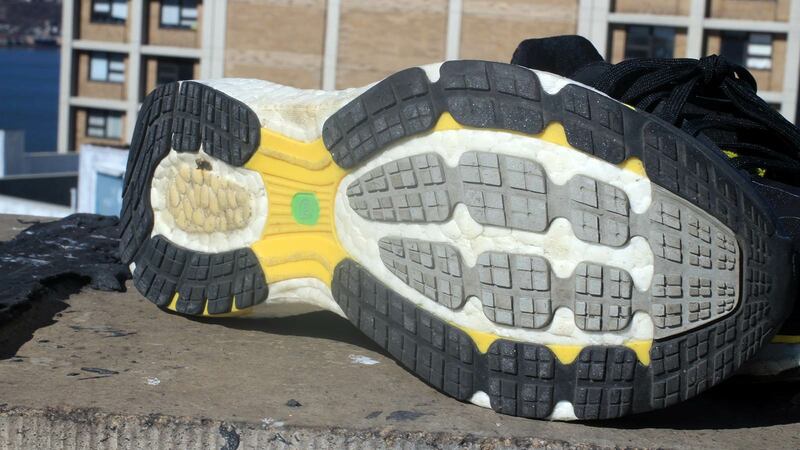 A lot of people questioned whether the ball-bearing test (wherein a ball bounced much higher off Boost than EVA foam) had any relevance to real running. It sort of does, but not like pogo sticks on your feet. I'd describe the sensation as putting a tiny spring on the back of a rocking horse. The Boosts have a decent sized drop (the difference between the height of the heel of the shoe from the height of the toe), but standing in them doesn't feel as awkward as it can in other high-drop shoes because of the Boost foam giving way to your heels so comfortably. I still got that can't-stand-still fidgety feeling you get from high-drop shoes, but when you do stand still, it's almost like standing on a water bed. One sneaky impressive thing is they're not just comfortable; they're immediately comfortable. Before I had a chance to really put them through their paces on a longer run, I had to run off to a foreign city to cover a conference, and then spent the next few days exploring on foot. I never blistered or chafed. People have strong opinions on mesh uppers. I happen to love them, so long as it's not cold or wet. Throughout testing the shoes, weather in New York was mostly cold and wet. No doubt, that will be enough to scare some people off, but the sheerness and relative lack of support was never an issue. This is a few-week test for shoes you'll presumably be using for much longer than that. We can't speak to actual scientific bearing out of energy consumption while running, or, more importantly, long-term injury risks that might be associated with the way the new material affects your body. For what it's worth, though, I am an ankle roller, and have not rolled my ankles while running in these. I've been running in minimalist shoes for a little over a year, so coming back to padded shoes was a bit of a jump. 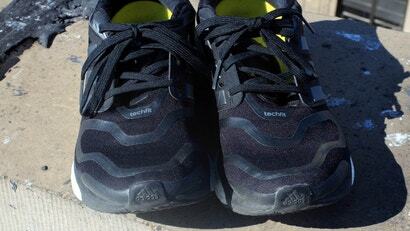 The thing that seemed exaggerated by the Boosts was a little extra fatigue in the toes and through the ankle and interior calf as the foam gave way much more than a thinner sole. 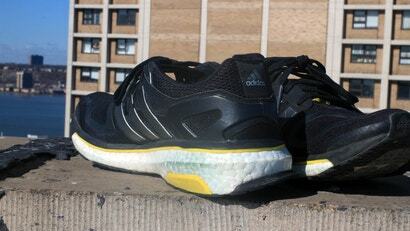 Adidas claims the Boost foam keeps its spring at extreme temperatures, unlike EVA foam. I used them during a cold spell in New York and they definitely felt softer than I'm used to shoes feeling when it's that cold (-6C). Adidas also claims the foam lasts longer than EVA (and, by association, Nike's relatively short-lasting Lunar foam), but we can't really speak to that after a month. They're still going though. I used these in one half of a football game on field turf, and turf shoes in the other half. Clearly not the fairest test, but this goes out to people who tend to buy one pair of trainers and use them for every sport they play: don't. These are great for general comfort and going on runs, but the Boost material, as it's deployed here, made cuts feel a little more sluggish than in even other non-turf running shoes. Sprinting, though, felt pretty awkward. These run about a half-size smaller than your typical shoe size. Everyone I talked to who got a pair had to go a half size larger than they typically do to get a good fit. They're comfortable as hell and feel lighter than they really are. The Boost material feels soft in the cold, and it hasn't broken down over a month-plus of daily use. The sole is still damn ugly, and discolours quickly. My soles are blue. I haven't been anywhere blue. Also, the drawbacks to the mesh upper are perpetually wet feet if you go running on an even slightly moist day. Probably! The Boosts are comfortable, perform well, and don't appear to suffer from any major defect. Maybe you're crazy set in your ways when it comes to running shoes. That's totally fine, of course. But if you're up for trying something new for your next pair of shoes, especially if you're a heel striker, these are a really nice choice. At the very least, go try them for yourself, since Adidas is practically begging people to take test runs in them.